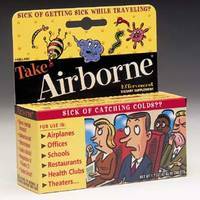 Airborne is an over the counter supplement that was created in the 1990's by Victoria -McDowell, was a school teacher. In 2008 Airborne was involved in a class action lawsuit when the company claimed that Airborne could cure and prevent the common cold. Since Airborne had no scientific research to back up this claim, Airborne was taken to court by the Federal TradeCommission for false advertising. The research was done by researchers without credibility. The Airborne study that states Airborne can cure and prevent the common cold. Was done by GNG Pharmaceutical which had no scientists in the in the company and was formed just to perform the Airborne study. According to the Center for Science in the Public Interest, "there's no credible evidence that what's in Airborne can prevent colds or protect you from a germy enviroment." In 2008 Airborne paid $2.3 million to customers who bought Airborne. Customers with proof of purchase were reimbursed for the Airborne they bought. Customers without proof of purchases were reimbursed for six packages. My mom swears by Airborne, and she is a teacher. I always tell her she is crazy and I still believe it is just a placebo effect. I remember the big law suit against the makers of Airborne, surprised it took so long for someone to do it. When it first came out, I was one of the believers that thought it was true, but I quickly realized it doesn't work at all not to mention it tastes nasty. The whole concept is to take it BEFORE you get sick, but its nearly impossible to tell when you are going to get sick. My ex used to buy me loads of this stuff, and it never prevented me from catching a cold. All it did was ruin the water I was drinking. I remember seeing generic brands, like a CVS verison, on shelves. Why not just buy vitamin C? I remember the first time I saw this product... it was on Oprah. I heard the claims that this product was made by a school teacher who was sick of always getting sick from her students so she developed this "magical pill" that would stop you from getting sick. Everyone knows that Oprah has a cult like following and if the woman claims something works, well then in their eyes, it does. Im not surprised that this product became as big as it did and I'm not surprised that people didn't even think that it wasn't working. The power the media has is amazing. I am defiantly one of the people that know this is really just a vitamin but when I feel like I am getting sick I feel like I have to take it. I just hate being sick and will do everything to prevent it.